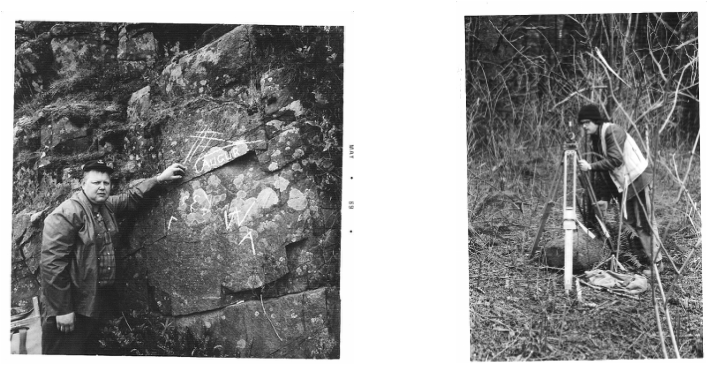 Former longtime Tillamook County Museum Director Wayne M. Jensen (left) poses alongside one of the incised rocks in this 1969 photo. Phil Costaggini positioned over an incised 'show rock' in 1979 during 1 of his many winter examination trips. Former longtime Tillamook County Museum Director Wayne M. Jensen poses alongside one of the incised rocks in this 1969 photo. MANZANITA - The Nehalem Valley Historical Society will host a lecture entitled "Survey of Artifacts Neahkahnie Mountain" this Saturday. Phil Costaggini, of M.S. Engineering Surveys will speak about the survey, begun in 1971 by the late Wayne M. Jensen, former director of the Tillamook County Pioneer Museum. Costaggini is a registered land surveyor in the State of Oregon, and has practiced since 1987. He holds degrees from Columbia University (B.A. History) and Oregon State University (M.S. Engineering Surveys). In completing his master's degree, Costaggini chose the Neahkahnie Mountain Survey Project, beginning in 1978. His first task was to meet Wayne Jensen, then the director of the Tillamook County Pioneer Museum, by way of referral from Costaggini's major professor. Jensen had explored the ground on and near Neahkahnie Mountain and it was his contention that artifacts found and recovered were remains of an ancient survey. Costaggini's work was twofold: to perform a cadastral survey to a thematically tie the artifacts and then to write a paper detailing the results and to explore some possible conclusions. Renewed interest in Francis Drake's Oregon location surfaced in 2008 when new research compiled chiefly from the Jensen collection of historical documents, archaeological evidence, maps, surveys, and Native American life and language were published in Garry Gitzen's "Francis Drake in Nehalem Bay 1579, Setting the Historical Record Straight". A commentary in the Oregon Archaeological Society Newsletter in December 2008 said this about the book, "...critics will have a Herculean task to overcome the lucid arguments of this book." Costaggini's entire thesis is reprinted as Appendix I in the book and provides verification that a 16th century land survey was indeed incised on numerous rocks laid atop cairns dispersed for more than a mile on the face of Neahkahnie Mountain. The Nehalem Valley Historical Society recently acquired a large centerpiece incised rock, which was used in the Francis Drake land survey. Donations are being accepted for the construction of a showcase with interpretative information to house the rock. The lecture is slated for Saturday, Sept. 26 at 3 p.m. at the Pine Grove Community Center, 225 Laneda Ave., Manzanita. The event is free and open to the public.